Even if sunlight is the best to observe shells, it causes a lot of damage to them. 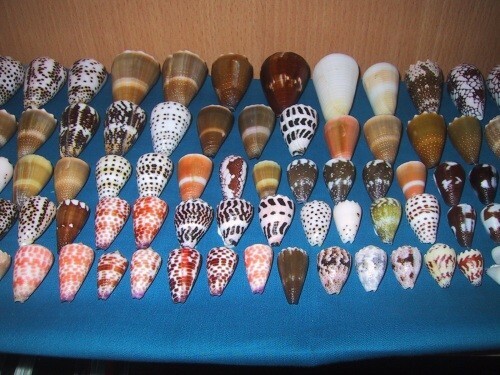 Of course, shells have different reaction to sunlight depending on their families. Cypraeidae, for example, is one of the most sensitive families. Their color fades fast. You have to know that all shells taken from their habitat will fade anyway. The only thing we can do is to slow the process. With some easy things to do you can consequently reduce the sunlight damages throughout the years. The only means is to hide the shells from sunlight. 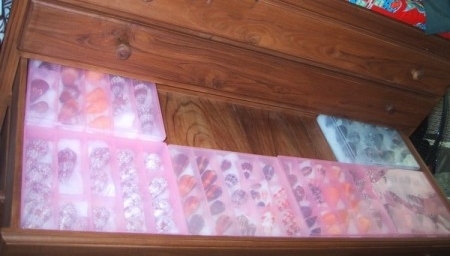 You can use small containers, any kind of plastic boxes,… But usually, the best way is to store them in a cabinet with many drawers, and if possible with different drawer sizes. (see the picture below). 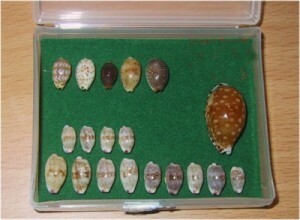 First of all, this short article reflects my own experience and i hope it will help the ones who don't know how to store their lovely shells. It is mainly a beginner guide. If any of you have comments, send them to me via mail and i'll ad them on this page. Dust can also causes damages throughout the years. 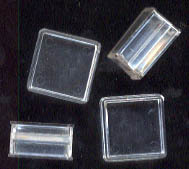 Dust particles move with the air current, and can enter almost anywhere. Dust contains many aggressive products for human (allergies) and also for the shells. So, it is much better to store your shells in a hermetically sealed compartment. Wood can also be a problem when you store shells for a long time in it. Some Woods are worse than others. In fact all "acid" ones are dangerous. In fact throughout the years, wood will emit some very small parts of its acid. 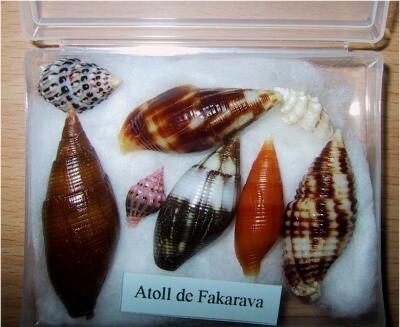 If this invisible acid stays too long on shells, it can damage them. 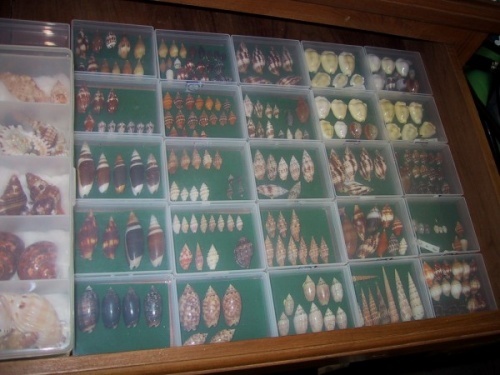 So it is again, more interesting to store your shells in a hermetically sealed compartment inside the wooden cabinet. 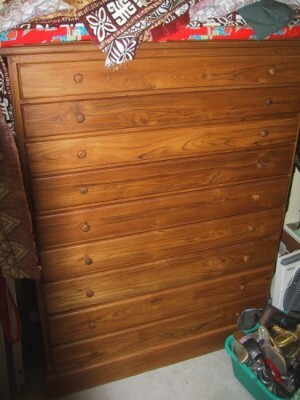 One day, I saw a huge collection which was stored in Oak (tree) cabinets. All the shells were like washed, just like if they were found beached ! For these acid species, the application of an "insulating layer" of the pore-filler type to the surface of the wood is recommended. I know it seems a bit funny but it is true ! Routhly speaking, our skin is a mixture of water & oil. That's why when you stick your hands on a clean glass, it leaves an oily mark. It is the same with your shells !! 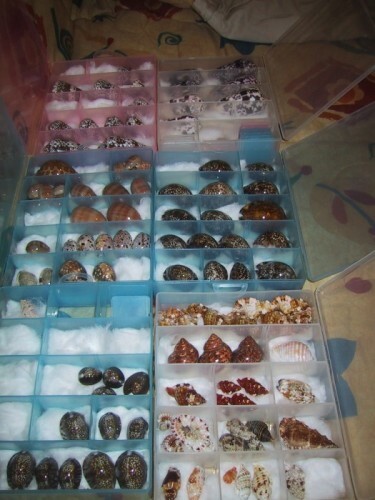 This is important for naturally shiny shells like Cowries. The oil will damage your shells. So when you touch them, clean them after with a clean piece of cloth. Concerning now the small containers to prevent your shells from dust-air-wood contamination. You can use all sort of stuff. 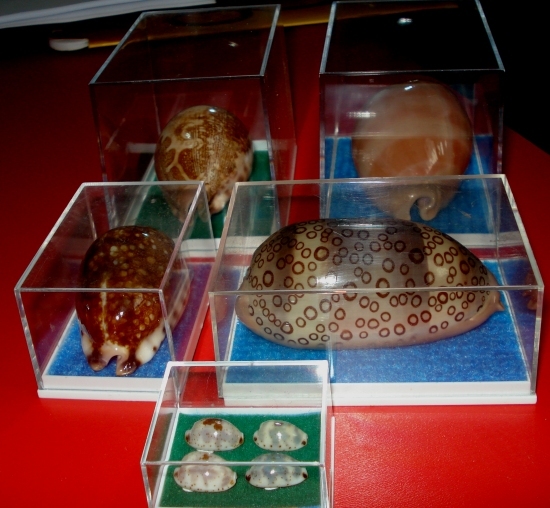 You can buy special individual plastic boxes, they are usually expensive but are best for presenting your shells. 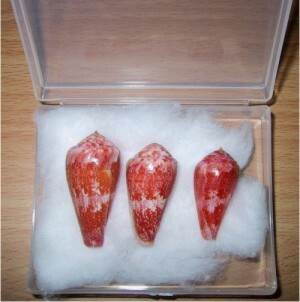 They are used also to store rocks, fossils, coins,… You can buy some for your rarest shells, though. 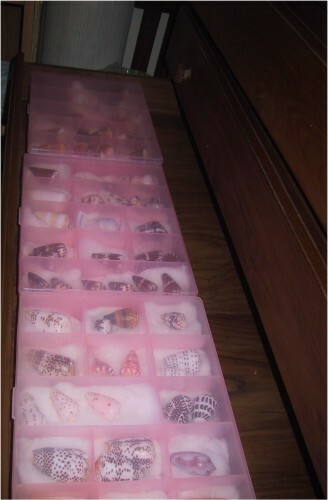 But no low cost boxes, will never display your shells as the expensive ones would do. 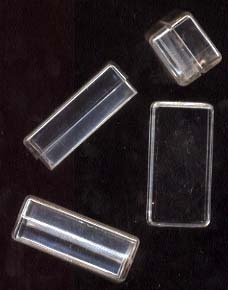 The main cause is the transparency of the plastic. 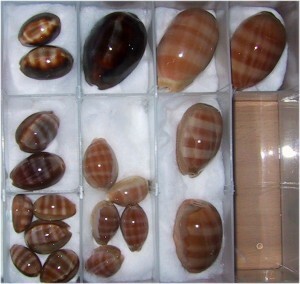 Those are not fully transparent and you have to open the box to fully observe shells. I do not mind, but maybe you do ! It will depend of your wallet J You have also to be careful when you collect several families. 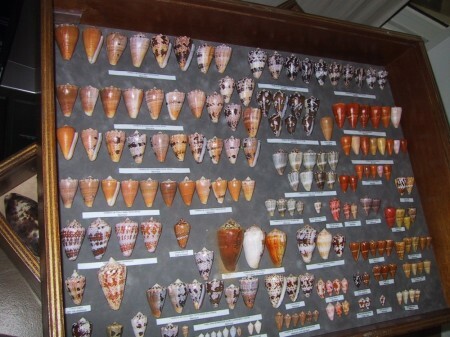 For example you collect mainly Coneshells & Cowries. You want to show them to somebody and so touch them. 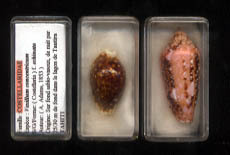 Start by Cowries because your coneshells should be oily (mineral oil) and so, when you pick up a cowrie you might leave oil on it Many things can be done to prevent your shells from being damaged ! !